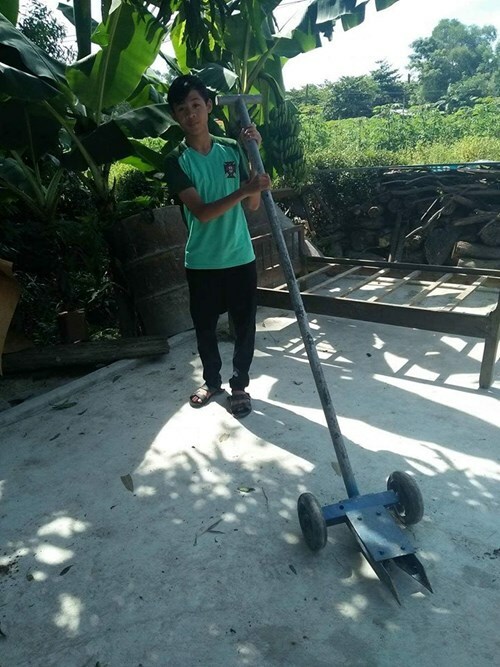 THỪA THIÊN-HUẾ — A secondary school student, Võ Hoàng Khanh, from Thừa Thiên-Huế Province, has designed an agricultural tool that allows farmers to easily uproot the cassava plant during harvest. Khanh hails from the central province’s Quảng Phú Commune, where a majority of the farmers, including his parents, grow rice and cassava. In his free time, Khanh helps his father harvest the crops. Khanh drew the sketch of a tool and then designed it with the help of physics teacher Phan Thanh Đông, also a neighbour, at the local Đặng Hữu Phổ Secondary School. Last April, when Khanh was a Grade 9 student, he and Đông finished making the tool and took it to the province’s youth creation competition, where Khanh won an encouragement merit award. The tool has a long handle bar, a mouth shaped like the beak of a bird, and two small wheels. The beak is used to get a firm grip on the cassava plant, the wheels work as a lever base, and the handle bar is part of the lever. The cassava grows like a bush with several plants growing out of one root, and the tool helps hold them in a tight grip to pull them up. Khanh gave the tool to his neighbouring farmers, who found it very useful to harvest cassava. 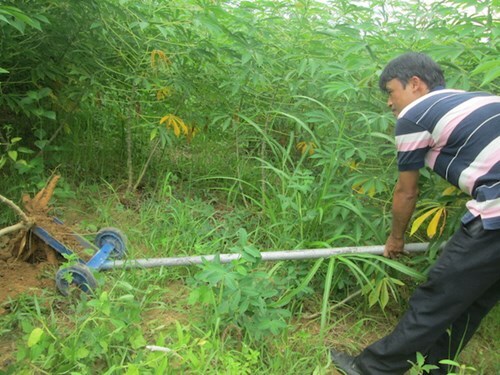 “With the tool, I spend only one hour instead of five hours using my bare hands to pull up the bushes on one plot,” said Phan Văn Tập, a farmer who has used Khanh’s tool. This reporter tried the tool out too, and, like the farmers, found it much easier to pull out the plant. However, Khanh said the tool is not yet fully effective as the mouth of the tool is too wide to hold the cassava bushes that grow without spreading out. “I am going to improve it before giving it out to farmers in the area,” said the Grade 10 student who goes to the local Nguyễn Chí Thanh High School. Võ Kim Dũng, Khanh’s father, is proud of his son. “He’s smart, obedient and loves physics,” said Dũng, who is learning to surf the internet so as to find a scholarship for Khanh. “He passed the entrance exam to a talented school in the city, but I can’t afford it, so he is studying in the rural school. Getting him a scholarship is the only way to help out,” said Dũng. Residents of the commune, who have used and appreciate Khanh’s invention, hope he will get the chance to train well and create more such tools to help farmers.